Home » Behind the Scenes » Blog » Meerkat Pups Are Here! Cashew watches over her babies. Christmas came a little early this year! 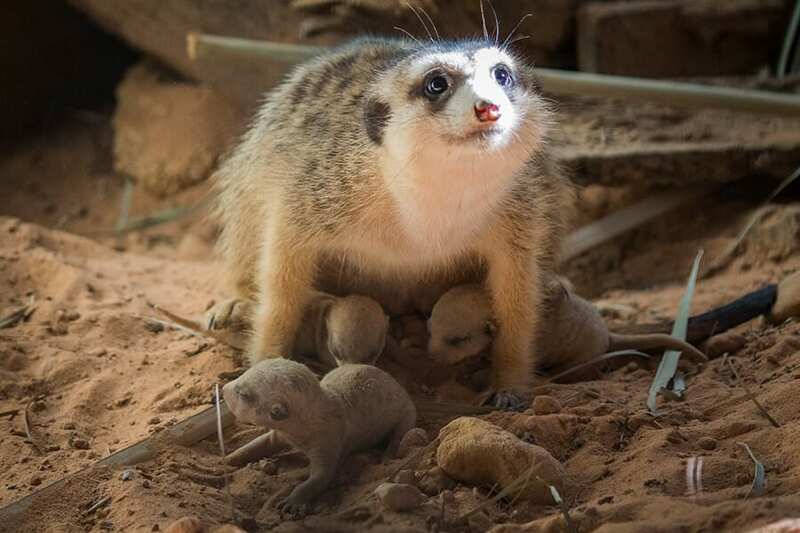 On December 4, three-year-old meerkat mom Cashew gave birth to three pups fathered by five-year-old Kirabo. They were born with their eyes and ears closed and weighed about one ounce each. The little ones, whose sexes are unknown at this time, are living behind the scenes with their parents and several other adults. This group is one of three meerkat “mobs” managed by our animal care team. They may move to a public-facing habitat next month. Update: Thanks to everyone who voted to name the pups. Say hello to Vixen, Comet and Cupid!